Taco Bell and Chipotle both have special offers for Halloween this year. Taco Bell will be giving away their new Black Jack Tacos. 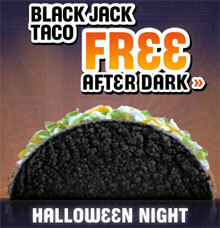 One free Black Jack Taco for every/anyone from 6 pm to Midnight on Halloween night. (Limit one per customer, while supplies last, etc, etc). Chipotle is giving away a free burrito, tacos, bowl or salad to anyone who comes into a Chipotle dressed as a Chipotle burrito. 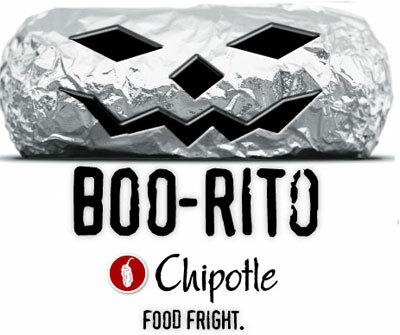 This promotion may not be at all locations, so call your local Chipotle for details, but the restaurants we've checked will be handing out Boo-ritos to the appropriately attired from 6 pm to close on Halloween night. haha! boo-rito is hilarious, i dont understand how people think of these things.